Embracing Cottage Style: Happy Easter! aw, happy easter to you too, sweetheart! What a beautiful bunny rabbit Easter card! 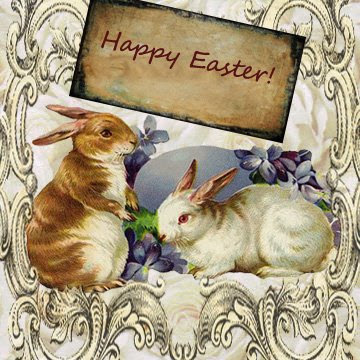 Thanks for sharing and have a HAPPY EASTER! Happy Easter Marcela! Sweet "virtual" card. I ate waaay too much chocolate and then stuffed myself full of love from my family. Thanks for including my light switch altered art in the blog post! Spring is here!